It will be my pleasure one day to point at her picture in a magazine or up on a billboard and say, “Nicole Antonuccio? I knew her back in the day in Pittsburgh. She was always great.” Nicole is one of those people who means what she says and delivers. She is a rarity, someone who dreams up big ideas and then actually pulls them off. I’m so proud of the work that Well Known Strangers has done on stage and I know a big part of the chemistry and camaraderie that exists is because Nicole got a little idea in her head for us to make a series of web videos. So we had a brainstorming session one afternoon. The group of us all sat around and bounced ideas back and forth. I tend to be a little cynical about these kind of things but Nicole addressed concerns and ideas and potential conflicts like a pro. Next thing I know, we’re having another meeting, building characters and creating scripts. Suddenly everyone is writing these scripts and these scripts are funny! Whoa, now we’re all in costume in Tessa’s boyfriend Alexei’s basement, filming these scripts. We have lights! Nicole is right there, directing us and acting and making our ideas a reality. Did I mention we were having a great time? We were! A damn blast. A couple days pass and Nicole sends us some raw footage. “I’m so excited you guys that I cut this together really quick.” The footage is fantastic. All the while, our shows are getting better, we’re getting better. In mid December we submit Well Known Strangers to the Chicago Improv Festival and I have to admit I kinda forget about it. Jump ahead to a late evening/early morning at the beginning of February. I’m dealing with a finicky dog when my phone dings an email alert. 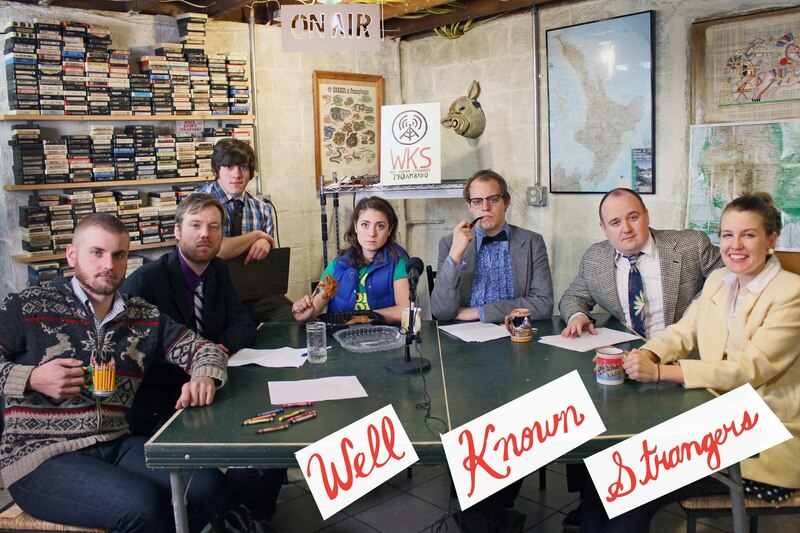 Well Known Strangers has been accepted to the Chicago Improv Festival. I’m wide awake now. It’s happening. We’re really that good. Nicole starts releasing the videos, each better than the last. I realize that I’m not nervous about shows anymore. I trust these people. They trust me. They’re funny. They think I’m funny. And honestly, wouldn’t that be it for you? Your group is doing well, you cut some fine web videos, maybe time for a break? Not Nicole. She sends an email out for some help developing another improv show. She’ll be playing a character and she wants help fleshing it out. I show up with Ben for a Friday(!) evening practice where we find Nicole and Connor ready to go with ideas. This is no idle thought. This is a real show. There is a plan and it is happening. A couple of weeks pass and I look on the Steel City Improv schedule to see the premiere of That’s What Jeanne Said, a live improvised talk show. Nicole took this idle idea and made it flesh and tangible and most importantly, it’s good. Better than good. Of course Nicole has produced sharp, funny web videos to promote this show too. Now it’s time to take a break? Nope no not at all. Nicole decides that Jeanne, in keeping with her character, an upstanding young lady looking to become a journalist and better her community, will take part in a half marathon to benefit Girls On The Run. Running a marathon in character, that is the Nicole Antonuccio dedication. During all this, inevitably really, Well Known Strangers wins Group of the Year at the SCIT Awards and Nicole is honored as Female Improviser of the Year, because real recognize real. This is the long way of saying that Nicole deserves it all and more because she puts in that work. This Friday April 12th she is presenting a special show of That’s What Jeanne Said that will benefit Girls On The Run and like everything else that Nicole is involved with, it will be great. You should go. 10pm. 5950 Ellsworth. Say you knew her when.